Hello lolli! 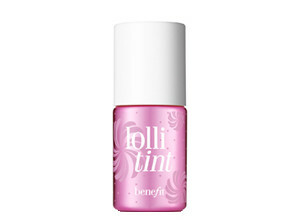 Our candy-orchid tint treats lips & cheeks to a “pop” of dreamy sweetness. It’s the flirtiest flush you can get from a bottle…and its smudge-proof, smooch-proof colour lasts from A.M. to P.M. Talk about stain power! I am an avid Benetint user, but this little gem has stolen the show for me. Like Benetint, it can be used as either a lip or a cheek stain. It’s easy to apply, and if you want the colour darker, you simply add more layers. The colour blends beautifully and adds a flirty blush to the skin. It lasts really long too, and I find I don’t need to reapply nearly as often as I would a lipstick. Plus the packaging is so cute, and it’s great to take with you wherever you go, as it’s a multi-tasking product. I’m very, very impressed!